On Monday night's CBS Evening News, anchor Katie Couric announced her day "on the campaign trail with Governor Palin" won't air until Tuesday, but CBS still made room for an excerpt of her time Monday in Ohio with Sarah Palin and John McCain in which Couric repeatedly pressed the two about an overheard comment Palin made Saturday about Pakistan, badgering them with five follow-ups before moving on to Palin's "reaction" to criticism of her answers during her previous Couric session. But a week-and-half-ago, when Couric's day on the campaign trail story with Joe Biden was delayed by news on the financial front, CBS ran video of Couric cuing up Biden on what he and Obama would do to resolve the crisis followed by one challenging question with no follow-up. At a Philadelphia restaurant on Saturday a man demanded: "So we do cross-border, like from Afghanistan to Pakistan, you think?" Palin answered: "If that's what we have to do stop the terrorists from coming any further in, absolutely, we should." Couric pounded away: "Is that something you shouldn't say out loud?" and "Are you sorry you said it Governor?" When McCain called it a "gotcha soundbite," Couric retorted: "It wasn't a 'gotcha.'" Couric turned to Palin: "What did you learn from that experience?" Palin: "That this is all about 'gotcha' journalism." Good Morning America reporter David Wright on Monday highlighted the specter of the "Palin Problem" for John McCain and asserted that Alaska Governor Sarah Palin's advisors "are trying to lower expectations. But even among some conservatives, expectations couldn't be any lower." Yet, while the ABC morning show mentioned the supposed struggles of the Republican vice presidential candidate, the program has ignored embarrassing gaffes from Senator Joe Biden. 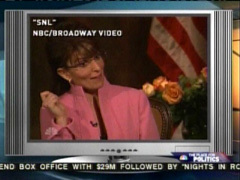 Wright played clips of Saturday Night Live mocking Palin for discussing the proximity of Alaska and Russia. Placing great weight in comics, he intoned: "... The comedians have their doubts" about Palin. However, GMA has failed to report on Joe Biden's doubly inaccurate assertion last week that "when the stock market crashed, Franklin D. Roosevelt got on the television" to calm people down. The morning program has also ignored video of the Delaware Senator telling a disabled man in a wheelchair to "stand up." On Monday's Today show, NBC's Andrea Mitchell loved Tina Fey's parodying of Sarah Palin on Saturday Night Live so much that she played a clip the 30 Rock star mocking Palin's inexperience while simultaneously airing an actual clip of Palin being interviewed by Katie Couric, as Mitchell charged: "The reviews have been withering for her interview with Katie Couric, only her third since nominated." However Mitchell didn't bother to air clips from SNL that mocked the Democratic side, most notably one that made fun of Barack Obama's relationship with Tony Rezko. And proving the old adage that the best way for a Republican or conservative to get air-time in the liberal media is to criticize a fellow Republican, Mitchell underscored so-called conservative critiques of Palin: "Palin's critics now include some conservatives commentators. On the National Review Web site, Kathleen Parker called on Palin to drop out." On Monday's CBS Early Show, co-host Harry Smith played a clip of the latest Saturday Night Live skit mocking Sarah Palin and following the clip, co-host Julie Chen remarked: "Tina Fey has just so much material to work with, this is like, probably a dream come true for her." In May, Chen placed Hawaii in the Atlantic Ocean and it was not part of a comedy skit. Co-host Maggie Rodriguez chimed in: "Well that's why Lorne Michaels was able to lure her back after she left, and I have a feeling she's going to be coming back a lot." During the recent Emmy awards, Tina Fey remarked: "I want to be done playing this lady Nov. 5...So if anybody can help me be done playing this lady Nov. 5, that would be good for me." With the vice presidential debate only a few days away, MSNBC gave a lot of attention on Monday to what Senator Joe Biden and Governor Sarah Palin are doing to prepare for their one and only debate. Along with this, MSNBC also gave a lot of airtime to Tina Fey's Saturday Night Live parody of Palin's interview with CBS Evening News anchor Katie Couric, showing clips of the skit seven times between 6:00 a.m. and 12:00 noon. However, only Morning Joe featured Saturday Night Live's parody of Senator Barack Obama, and even then the focus was on the portion of the skit which parodied Senator John McCain's "gimmicks." Of the seven times that MSNBC showed clips from Tina Fey's Palin impersonation, many of them lead into discussion about Palin's lack of foreign policy expertise and comments about how Fey's impersonation could lead to negative effects for McCain's campaign. On Monday night's CBS Evening News, anchor Katie Couric announced her day "on the campaign trail with Governor Palin" won't air until Tuesday, but CBS still made room for an excerpt of her time Monday in Ohio with Sarah Palin and John McCain in which Couric repeatedly pressed the two about an overheard comment Palin made Saturday about Pakistan, badgering them with five follow-ups before moving on to Palin's "reaction" to criticism of her answers during her previous Couric session. But a week-and-half-ago, when Couric's day on the campaign trail story with Joe Biden was delayed by news on the financial front, CBS ran video of Couric cuing up Biden on what he and Obama would do to resolve the crisis followed by one challenging question with no follow-up. At a Philadelphia restaurant on Saturday a man demanded: "So we do cross-border, like from Afghanistan to Pakistan, you think?" Palin answered: "If that's what we have to do stop the terrorists from coming any further in, absolutely, we should." Couric decided: "That's almost the exact position Barack Obama has taken and that you, Senator McCain, have criticized as something you do not say out loud. So, Governor Palin, are you two on the same page on this?" Couric pounded away: "Is that something you shouldn't say out loud?" and "Are you sorry you said it Governor?" When McCain called it a "gotcha soundbite," Couric retorted: "It wasn't a 'gotcha.'" Couric turned to Palin: "What did you learn from that experience?" Palin: "That this is all about 'gotcha' journalism." KATIE COURIC: Barack Obama's running mate, Joe Biden, spent the day in this all important swing state, first visiting the Football Hall of Fame in Canton, then talking to union members in Akron. After that speech, I rode with on the bus from Akron to Youngstown and asked him what three things an Obama administration would do right now to calm the panicky financial markets. JOE BIDEN: If you're President right this minute, one, explain to the American people what's happened, why we're in this trouble. They don't know. President hasn't said anything, to the best of my knowledge. People got to know what is it, why are you doing what you -- how did this get here and what are you going to do about it? Secondly, immediately implement a transparency that says that every one of those companies we're giving -- those outfits that we're giving help to bail out, the solidify the markets say, "And, by the way, here's the deal, we get to look at your books. Don't tell me we're going to lend you the money and me not know exactly, exactly what you own and what you have." And the third thing I would do is demonstrate to the American people that you're really going to begin to invest. Stop the things that caused the problem, these profligate tax cuts that are raising the deficit, causing us to borrow money from China, to pay for oil from Saudi Arabia. Go out there and tell them you're immediately going to do something about the housing crisis. COURIC: You talk about tax cuts, and there's been quite a brouhaha about your comment that paying higher taxes for those making $250,000 a year and over is the patriotic thing to do. Your vice presidential rival, Sarah Palin, Governor Palin, said: "To the rest of America, that's not patriotism. Raising taxes is about killing jobs and hurting small businesses and making things worse." BIDEN: How many small businessmen are making $1,400,000 a year average in the top one percent? Give me a break. I remind my friend John McCain what he said. When Bush called for war and tax cuts he said, quote: "It is immoral, immoral to take a nation to war and not have anybody pay for it." I am so sick and tired of this phoniness. The truth of the matter is that we are in trouble, and the people who do not need a new tax cut should be willing, as patriotic Americans, to understand the way to get this economy back up on their feet is to give middle-class taxpayers a break. We take the tax cut they're getting and we give it to the middle class. COURIC: Tomorrow I'll have a lot more as I bring you a day in the life of Joe Biden out on the campaign trail. KATIE COURIC: John McCain and Sarah Palin were here in Columbus today for a campaign rally. And in their first joint interview, I asked them about a statement Governor Palin made on Saturday which didn't seem to square with her running mate's position on Pakistan. COURIC, TO PALIN: Over the weekend, Governor Palin, you said the U.S. should absolutely launch cross-border attacks from Afghanistan into Pakistan to, quote, "stop the terrorists from coming any further in." Now, that's almost the exact position Barack Obama has taken and that you, Senator McCain, have criticized as something you do not say out loud. So, Governor Palin, are you two on the same page on this? SARAH PALIN: We had a great discussion with President Zardari as we talked about what it is that America can and should be doing together to make sure that the terrorists do not cross borders and do not ultimately put themselves in a position of attacking America again or her allies. And we will do what we have to do to secure the United States of America and her allies. COURIC: Is that something you shouldn't say out loud, Senator McCain? 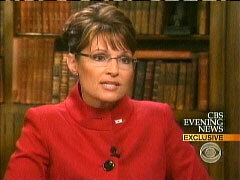 COURIC TO PALIN: Are you sorry you said it Governor? COURIC: It wasn't a "gotcha." She was talking to a voter. McCAIN: No, she was in a conversation with a group of people and talking back and forth. And I'll let Governor Palin speak for herself. PALIN: In fact, you're absolutely right on. In the context, this was a voter, a constituent, hollering out a question from across an area asking, "What are you gonna do about Pakistan? You better have an answer to Pakistan." I said we're gonna do what we have to do to protect the United States of America. PALIN: Well, as Senator McCain is suggesting here, also, never would our administration get out there and show our cards to terrorists, in this case, to enemies and let them know what the game plan was, not when that could ultimately adversely affect a plan to keep America secure. COURIC: What did you learn from that experience? PALIN: That this is all about "gotcha" journalism. A lot of it is. But that's okay, too. COURIC: Governor Palin, since our last interview, you've gotten a lot of flak. Some Republicans have said you're not prepared; you're not ready for prime-time. People have questioned your readiness since that interview. And I'm curious to hear your reaction. PALIN: Well, not only am I ready, but willing and able to serve as Vice President with Senator McCain if Americans so bless us and privilege us with the opportunity of serving them, ready with my executive experience as a city mayor and manager, as a Governor, as a commissioner, a regulator of oil and gas. McCAIN: This is not the first time that I've seen a Governor being questioned by some quote, "expert." I remember that Ronald Reagan was a "cowboy." President Clinton was a Governor of a very small state that had "no experience" either. In fact, I remember how easy it was gonna be for Bush I to defeat him. I still recall, whoops, that one. But the point is, I've seen underestimation before. I'm very proud of the excitement that Governor Palin has ignited with our party and around this country. It is a level of excitement and enthusiasm, frankly, that I haven't seen before. And I'd like to attribute it to me. But the fact is that she has done incredible job and I'm so proud of the work that she's doing. COURIC: Tomorrow: On the campaign trail with Governor Palin. Couric Has Cushy Chat with Biden, Will She Be as Warm with Palin? - Ignore obvious factual/historical flubs: (Biden: "When the stock market crashed, Franklin Roosevelt got on television...") FDR was not in office at the time of the 1929 crash and his "fireside chats" were on the radio. Good Morning America reporter David Wright on Monday highlighted the specter of the "Palin Problem" for John McCain and asserted that Alaska Governor Sarah Palin's advisors "are trying to lower expectations. But even among some conservatives, expectations couldn't be any lower." Yet, while the ABC morning show mentioned the supposed struggles of the Republican vice presidential candidate, the program has ignored embarrassing gaffes from Senator Joe Biden. The morning program has also ignored video of the Delaware Senator telling a disabled man in a wheelchair to "stand up." Instead, in a very condescending tone, Wright explained: "Sarah Palin has been trying hard to prove herself. Hobnobbing with world leaders at the U.N., sitting down with influential anchormen and women." 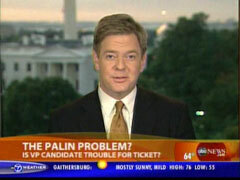 An ABC graphic warned, "The Palin Problem: Is VP Candidate Trouble for Ticket?" Wright also played the classic media game of highlighting conservatives attacking each other. He first mentioned dissension "even among some conservatives" and later exclaimed: "This weekend, even Fox News raised questions." Wright featured BeliefNet and Dallas Morning News columnist Rod Dreher deriding, "It's going to be very, very hard to erase the impression she's given in the network TV interviews that she is in way, way over her head and she's not ready for prime time." A Nexis search for ABC finds only one other interview with the columnist. In a follow-up piece on Monday's show, former Democratic operative-turned journalist George Stephanopoulos called Palin "a problem for Senator McCain" and complained, "...The buzz on Sarah Palin has gone all bad. When you become, as you know, Robin, when you become a punch line in politics, it's one of the worst things that can happen." ROBIN ROBERTS: And now, those that will inherit this economic mess, the race for the White House. Both campaigns revving up for the stop later this week in St. Louis, where on Thursday, the one and only vice presidential debate between Senator Joe Biden and Governor Sarah Palin, who went jogging yesterday in the Philadelphia area, that will take place in St. Louis. On the latest for this, we go to ABC's David Wright who is in Washington. Good morning, David. DAVID WRIGHT: Good morning, Robin. Sarah Palin has a relatively light schedule over the next couple of days as she prepares for that big debate. That video that you just rolled there of her jogging through the streets of Philadelphia, looking a bit like Rocky Balboa. Her advisors are trying to lower expectations. But even among some conservatives, expectations couldn't be any lower. ABC GRAPHIC: The Palin Problem: Is VP Candidate Trouble for Ticket? WRIGHT: Sarah Palin has been trying hard to prove herself. Hobnobbing with world leaders at the U.N., sitting down with influential anchormen and women. KATIE COURIC: You cited Alaska's proximity to Russia as part of your foreign policy experience. What did you mean by that? GOVERNOR SARAH PALIN: That Alaska has a very narrow maritime border between a foreign country, Russia, and on our other side, the land boundary that we have with Canada. KATIE COURIC: Well, explain to me why that enhances your foreign policy credentials? PALIN: Well, it certainly does because our next door neighbors are foreign countries. They're in the state that I am the executive of. WRIGHT: Judging from "Saturday Night Live," the comedians have their doubts. "KATIE COURIC:" You went to the U.N. For the first time. How was that experience? "SARAH PALIN:" Oh, you know, it was just amazing. So many interesting people. Though, I have to say, I was disheartened by how many of them were foreigners. WRIGHT: Some voters we've met have their doubts, too. CINDY HABLE (Colorado voter): Can they do this? Can they be the president if something happens to John McCain? That's my question. WRIGHT: This weekend, even Fox News raised questions. BRET BAIER: Coming up on the Grapevine, are some Republicans turning on Sarah Palin? WRIGHT: Highlighting conservative critics of Palin. ROD DREHER (Dallas Morning News/Beliefnet): It's going to be very, very hard to erase the impression she's given in the network TV interviews that she is in way, way over her head and she's not ready for prime time. WRIGHT: At an Irish public in Philly, the crowd watching the debate with her was friendly. But outside not so much. John McCain told George Stephanopoulos he's not concerned. SENATOR JOHN MCCAIN: They can complain all they want to. I'll rely on the American people. The American people have responded to her in a way that's been wonderful. WRIGHT: But how will Palin fare in a 90-minute debate with Joe Biden? KEVIN MADDEN (political analyst): Sarah Palin has to get through this debate by avoiding a really big mistake, by looking unready to assume the office. WRIGHT: Now, Palin's advisers tell us they're not worried one bit. They are reportedly bringing in the heavy-hitters to give her the last-minute coaching tips. They know that she needs to address the question of experience and they tell us, she's looking forward to it. On Monday's Today show, NBC's Andrea Mitchell loved Tina Fey's parodying of Sarah Palin on Saturday Night Live so much that she played a clip the 30 Rock star mocking Palin's inexperience while simultaneously airing an actual clip of Palin being interviewed by Katie Couric, as Mitchell charged: "The reviews have been withering for her interview with Katie Couric, only her third since nominated." And proving the old adage that the best way for a Republican or conservative to get air-time in the liberal media is to criticize a fellow Republican, Mitchell underscored so-called conservative critiques of Palin: "Palin's critics now include some conservatives commentators. On the National Review Web site, Kathleen Parker called on Palin to drop out." MATT LAUER: The economy is the big issue in the presidential race and that rescue plan is getting a lot of attention from both candidates fresh off their first presidential debate. NBC's Andrea Mitchell is in Washington with more on that side of the story. Andrea, good morning to you. ANDREA MITCHELL: Well good morning, Matt. Both John McCain and Barack Obama voice tentative support for the bailout bill, but advisers in both campaigns know that as the economy dominates the news it could help Obama and the Democrats in the closing weeks of this campaign. BARACK OBAMA: Thank you North Carolina! MITCHELL: Obama tried to take advantage. MITCHELL: Holding three rallies this weekend. OBAMA: We don't just need a plan for bankers and investors, we need a plan for auto-workers! JOHN MCCAIN: This is something that all of us will swallow hard and, and go forward with. The option of doing nothing is simply not an acceptable option. MITCHELL: In their first debate, Friday night, McCain was the aggressor. MCCAIN: I honestly don't believe that Senator Obama has the knowledge or experience and has made the wrong judgments in a number of areas. MITCHELL: But Obama held his own on foreign policy, McCain's presumed strength. OBAMA: You said we knew where the weapons of mass destruction were -- you were wrong. You said that we were gonna be greeted as liberators -- you were wrong. 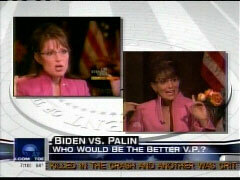 MITCHELL: This week the debate pressure is on Sarah Palin as she prepares for her one debate with Joe Biden. Ann, asked Biden about the challenge of debating a woman. ANN CURRY: Can you hit a woman? JOSEPH BIDEN: I don't, I don't verbally attack anybody. CURRY: Is there a double-standard, is what I'm asking? JOE BIDEN: I have no double-standard. Look at my debates. I debated Hillary Clinton 12 times. Tell me she's not a competent debater. MITCHELL: Michigan Governor Jennifer Granholm will play Palin in rehearsals. But it's Tina Fey who has the most practice. TINA FEY AS SARAH PALIN: Katie I'd like to use one of my lifelines. AMY POEHLER AS KATIE COURIC: You don't have any lifelines. FEY: Well in that case I'm just gonna have to get back to ya! MITCHELL: Palin is still drawing big crowds but the reviews have been withering for her interview with Katie Couric, only her third since nominated. SARAH PALIN: But ultimately what the bailout does is help those who are concerned about the health care reform that is needed to help shore up our economy, helping, it's gotta be all about job creation. FEY AS PALIN: Those that are concerned about the health care reform that is needed to help shore up our economy. To help, it's gotta be all about job creation. MITCHELL: Palin's critics now include some conservatives commentators. On the National Review Web site, Kathleen Parker called on Palin to drop out, writing, "Quick study or not, she doesn't know enough about economics and foreign policy to make Americans comfortable with a President Palin, should conditions warrant her promotion." And New York Times columnist David Brooks with Chris Matthews. DAVID BROOKS: But is she ready to be vice president? Based on what we've seen with the Katie Couric interview, it's embarrassing. It's painful to watch those things. You want to turn them off. MITCHELL: Although Joe Biden is a far more experienced politician and debater, he's had a few gaffes on the campaign trail, increasing the political drama of this coming match-up. Matt? Later, Smith played a clip of the first part of his interview with Sarah Palin's parents, Chuck and Sally Heath. Chuck Heath said he thought Fey's impersonation was funny: "They replayed that, and replayed that, and replayed that. I thought it was kind of cute, yeah, yeah. Yeah, Tina Fey did a good job." Smith began the interview by asking the Heaths: "What would you tell folks who would say 'I'm not -- I'm not so sure that Sarah Palin's ready to be vice president.' What would you tell them?" Chuck Heath replied: "She's ready to do anything she wants to be. And she's -- she perseveres, she works so hard. She learns so fast. Yeah. I worry about that at all. That's what I'll tell them, yeah. If you want some honesty, yeah, not a typical politician, get her, yeah." JULIE CHEN: Palin on the hot seat as she readies for her debate. Some conservatives want Sarah Palin off the Republican ticket but in their first TV interview, Palin's parents defend their daughter. HARRY SMITH: What would you tell them? CHUCK HEATH: She's ready to do anything she wants to be. SMITH: We ran up to Wasilla. It's not exactly like, you know, going to Westchester county but -- we had a wonderful visit up there with Chuck and Sally Heath, that's Sarah Palin's parents. What a magnificent, majestic place to live and to raise a family. And they have some very interesting things to say about their daughter. We'll hear that in a little bit. RODRIGUEZ: Coming up in our next half hour, Harry's exclusive interview from Alaska with the parents of Sarah Palin. CHEN: Coming up next, what is Sarah Palin really like? We're going to ask her parents. SMITH: And just in case you didn't get a chance to stay up and watch 'Saturday Night Live,' Saturday night, take a look at this. AMY POEHLER: You went to the U.N. for the first time, how was that experience? TINA FEY: Oh, you know it was just amazing. So many interesting people, though, I have to say I was disheartened by how many of them were foreigners. I promise that when Senator McCain and I are elected, we're going to get those jobs back in American hands. CHEN: Tina Fey has just so much material to work with, this is like, probably a dream come true for her. RODRIGUEZ: Well that's why Lorne Michaels was able to lure her back after she left, and I have a feeling she's going to be coming back a lot. SMITH: And still ahead, what Sarah Palin is really like. We're going to talk to her parents in our next half hour. HARRY SMITH: We want to talk a little bit as a preview, of course, Thursday is the big vice presidential debate between Joe Biden and Sarah Palin. Over the weekend I had the pleasure of meeting with Governor Palin's parents. It's morning in Alaska. Sarah Palin's parents, Chuck and Sally Heath, admire the majesty that surrounds their home. SALLY HEATH: Every morning when the sun comes up, that's what's out there. CHUCK HEATH: Well, someone says it's a good view but the mountain gets in the way. Yeah. SMITH: It's a long way from Wasilla to Washington, D.C.
HEATH: I think our record is 11 moose at one time in our yard. SMITH: Just right here in the yard? HEATH: Right here in the yard. SMITH: Just weeks ago, the Heath's third child, a self-proclaimed hockey mom and wildly popular governor of Alaska, was thrust into the national spotlight beside John McCain. SARAH PALIN: Senator, I am honored to be chosen as your running mate. SMITH: What would you tell folks who would say 'I'm not -- I'm not so sure that Sarah Palin's ready to be vice president.' What would you tell them? CHUCK HEATH: She's ready to do anything she wants to be. And she's -- she perseveres, she works so hard. She learns so fast. Yeah. I worry about that at all. That's what I'll tell them, yeah. If you want some honesty, yeah, not a typical politician, get her, yeah. SALLY HEATH: She's got that ability to relate to people. She's diplomatic, she can get her point across. PALIN: My mom and dad both worked at the elementary school in our small town and among the many things I owe them is a simple lesson that I've learned that this is America and every woman can walk through every door of opportunity and my parents are here tonight. SMITH: How did you feel when she stood up and gave her speech at the Republican convention? SMITH: Of their four children, it was Sarah who always had a mind of her own. HEATH: I could bend my other kids and have them do things and if she knew she was right, I had a hard time convincing her there was another way of doing it, but she was usually always right and could justify what she wanted to do, yeah. Very strong-willed and very hard-working. SMITH: What is it like then now? Everybody's talking about Sarah Palin. SALLY HEATH: Well, I hope the world gets to know the real person, because she is a remarkable girl. SMITH: Whose achievements are immortalized on the walls of her parents' home. Miss Wasilla 1984? CHUCK HEATH: 1984, Miss Wasilla. She won a few dollars for that. I wasn't really into the pageant thing, but she convinced me that, well it's worth a little money and it was, yeah. They made a spoof on 'Saturday Night Live.' I can see Russia from my house. I'm two miles from Russia right here [points to a photograph]. SMITH: Did you watch that 'Saturday Night Live'? HEATH: I saw the tape. I know that, yeah. AMY POEHLER, AS HILLARY CLINTON: I believe that diplomacy should be the cornerstone of any foreign policy. TINA FEY, AS SARAH PALIN: And I can see Russia from my house. HEATH: They replayed that, and replayed that, and replayed that. I thought it was kind of cute, yeah, yeah. Yeah, Tina Fey did a good job. SMITH: With three days until the debate, Palin's parents have no doubt she'll surprise even her harshest critics. What part of her personality, or her upbringing, is going to serve her best in all of this? HEATH: Hard-working, perseverance, honesty, yeah, honesty. She won't fabricate things or exaggerate things. She'll tell it the way it is, yeah. SMITH: We'll have more on that tomorrow. With the vice presidential debate only a few days away, MSNBC gave a lot of attention on Monday to what Senator Joe Biden and Governor Sarah Palin are doing to prepare for their one and only debate. Along with this, MSNBC also gave a lot of airtime to Tina Fey's Saturday Night Live parody of Palin's interview with CBS Evening News anchor Katie Couric, showing clips of the skit seven times between 6:00 a.m. and 12:00 noon. However, only Morning Joe featured Saturday Night Live's parody of Senator Barack Obama, and even then the focus was on the portion of the skit which parodied Senator John McCain's "gimmicks." Of the seven times that MSNBC showed clips from Tina Fey's Palin impersonation, many of them lead into discussion about Palin's lack of foreign policy expertise and comments about how Fey's impersonation could lead to negative effects for McCain's campaign. Joe Scarborough, host of Morning Joe, called the parody "devastating," and Willie Geist got in a little jab of his own on Palin after he showed a clip of the skit which ridiculed her opinion on the proposed $700 billion bailout, saying "she looked a little lost there, guys" and later adding, "I'm not sure she quite answered the question there." Later, host Contessa Brewer asked: "Is this something that the Palin camp is worried about, this image problem that she doesn't know foreign policy?" Tamron Hall also brought up this negative image of Palin and wondered what the McCain camp was doing to counter any negative effects it might have on the campaign. Hall also worried if it is "fair that Joe Biden might be held to a higher standard" in Thursday's debate. JOE SCARBOROUGH, host: I want to show him a clip from "Saturday Night Live." Mike, take a look at this. AMY POEHLER, AS KATIE COURIC: What lessons have you learned from Iraq and how specifically would you spread democracy abroad? TINA FEY, AS SARAH PALIN: Specifically, we would make every effort possible to spread democracy abroad to those who want it. Katie, I'd like to use one of my lifelines. FEY: I want to phone a friend. POEHLER: You don't have any lifelines. FEY: Well in that case, I'm going to have to get back to ya! SCARBOROUGH: Oh, no. Mike Barnicle. That was a devastating parody, was it not? WILLIE GEIST: Let's go back to Tina Fey and Sarah Palin. It was just a relentless assault on Sarah Palin to open the show "Saturday Night Live" on Saturday. Just coming off the interview with Katie Couric, the CBS interview this week, they recreated it their way. Amy Poehler as Katie Couric asking Tina Fey as Sarah Palin about the bailout. Here's Sarah Palin's answer. AMY POEHLER: What's your opinion of this potential $700 billion bailout? TINA FEY: Like every American I'm speaking with, we are ill about this. We're saying, hey, why bail out Fannie and Freddie and not me? But ultimately what the bailout does is help those that are concerned about the healthcare reform that is needed to help shore up our economy to help, um, -- it's got to be all about job creation to, also to shoring up our economy and putting Fannie and Freddie back on the right track and so health care reform and reducing taxes and reigning in spending 'cause Barack Obama, you know. GEIST: She looked a little lost there, guys. WILLIE GEIST: Time for some news you can't use. As I've just mentioned, a busy night upstairs, eighth floor. "Saturday Night Live." They started with Sarah Palin. They rolled out. They were spoofing the Katie Couric interview with Sarah Palin this week. Amy Poehler as Katie Couric. Tina Fey reprising her role as Sarah Palin talking about the bailout package. AMY POEHLER: What's your opinion of this $700 billion bailout. TINA FEY: Like every American I'm speaking with, we are ill about this. We're saying, hey, why bail out Fannie and Freddie, and not me? But ultimately what the bailout does is help those that are concerned about the health care reform that is needed to help shore up our economy to help, um, -- it's got to be all about job creation, too. Also, too, shoring up our economy and putting Fannie and Freddie back on the right track and so health care reform and reducing taxes and reigning in spending 'cause Barack Obama, you know. GEIST: I'm not sure she quite answered the question there. It went on like that for several minutes there. Tina Fey again nailing Sarah Palin. TAMRON HALL, host: Plus the vice presidential debate. You know it's about Sarah Palin versus Joe Biden. But what about the Palin versus Tina Fey debate? AMY POEHLER: You went to the U.N. for the first time. How was that experience? TINA FEY: Oh, you know, it was just amazing. So many interesting people. Though I have to say I was disheartened by how many of them were foreigners. I promise that when Senator McCain and I are elected we're gonna get those jobs back in American hands. CONTESSA BREWER, host: And I know that there was this interesting moment on "Saturday Night Live" with another spoof of Sarah Palin. Play it and talk about it on the other side. BREWER: And they were joking about Sarah Palin and her reaction to her visit to the United Nations. Is this something that the Palin camp is worried about, this image problem that she doesn't know foreign policy? TAMRON HALL, host: Sarah Palin is coming off a bit of a rough week headed into Thursday's debate. First she was widely criticized for struggling through an interview on CBS. And then she was skewered for a second time Saturday Night Live. AMY POEHLER: What lessons have you learned from Iraq and how specifically would you spread democracy abroad? TINA FEY: Katie, I'd like to use one of my lifelines. FEY: Well, in that case I'm just going to have to get back to you. HALL: But could low expectations actually help Sarah Palin heading into this VP debate? And on the flip side, is it fair that Joe Biden might be held to a higher standard? TAMRON HALL, host: But I want to talk to you, Savannah, about this parody on "Saturday Night Live." People are talking about it. The impersonation and what this could mean for the election. Let's take a look at it. AMY POEHLER: I want to give you one more chance to explain your claim that you have foreign policy experience based on Alaska's proximity to Russia. What did you mean by that? TINA FEY: Well, Alaska and Russia are only separated by a narrow maritime border. You've got Alaska here. And this right here is water. And then that's, up there's Russia. So we keep an eye on them. HALL: So, Savannah, we know these politicians watch SNL. You remember when during the debate, Hillary Clinton brought up the SNL skit where she was kinda being treated improperly by the media. But let me ask you about the McCain campaign. What are they doing to fight this image that now is all over YouTube, all over the place and people at work talking about it at the water cooler right now?